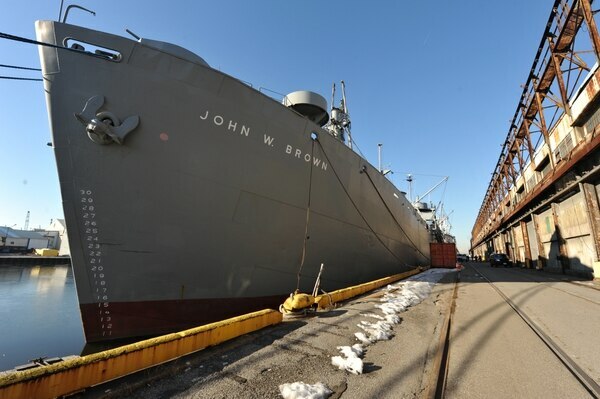 BALTIMORE — During World War II, the Liberty ship John W. Brown pushed through the Mediterranean Sea and Persian Gulf, bearing everything from men to meat to munitions in an effort to bring a victory for the Allies. Later this month, the ship will slice through the Elizabeth River to bring a chunk of that past to Norfolk. The Brown, now a floating museum in Baltimore, will be in Norfolk for its Living History Cruise on Sunday, May 22. It will have re-enactors portraying the U.S. Navy Armed Guard, who protected the ship, and entertainers such as the Andrew Sisters and comedy duo Abbott and Costello. After lunch, a "surprise" attack by a Japanese Zero might ensue. The trip back in time, however, is to help keep the boat afloat now. The Brown is one of only two functioning Liberty ships that remain from the more than 2,700 that were built to support the war effort. The other, the Jeremiah O'Brien, is berthed in San Francisco. The ships were designed as simple cargo steamers that could be put together in an average of 42 days, in shipyards from Portland, Ore., to Portland, Maine. President Franklin D. Roosevelt remarked, "She'll carry a good load. She isn't much to look at, though, is she? A real ugly duckling." So the ships got the "ugly duckling" nickname, but were known as Liberty ships. The first one completed was named after Virginian Patrick Henry, the Revolutionary War patriot who famously declared, "Give me liberty or give me death." The Brown was named after a Maine labor leader who died in 1941, a year before the ship was completed. 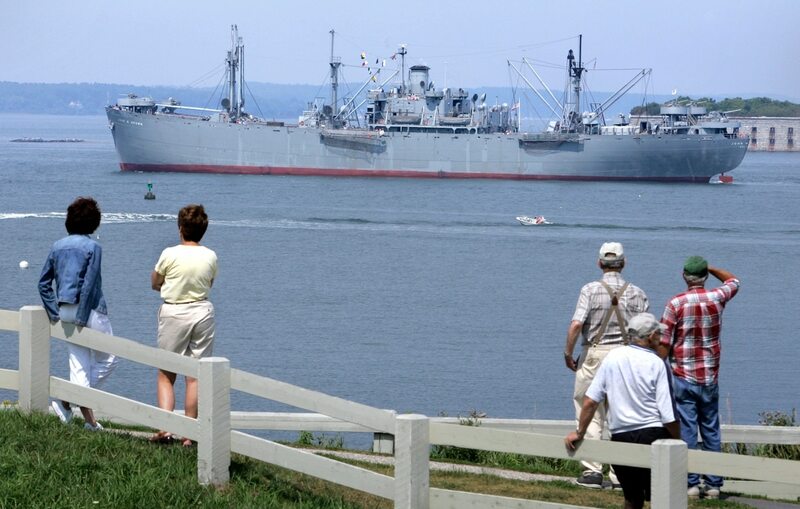 While perhaps basic, the Liberty ships transported two-thirds of all cargo that left the U.S during the war, according to Project Liberty Ship, the nonprofit that maintains the Brown. The Brown could carry as much as 300 railroad boxcars worth of goods, including 500 men. "There's no plane that could touch that; that's quite a lot of cargo," said Duff Porter III of Portsmouth, who has volunteered to work on the Brown since 1991. "For every soldier in the field, you have four people behind him providing supplies." Porter, 72, tried to get into the Navy many years back but flunked the physical. He started working as an apprentice at the Norfolk Naval Shipyard in 1964. He retired 35 years later. A friend called him and asked if he wanted to tag along on a "matron" voyage of the Brown. "I made some new friends, made some old, and I got hooked." BALTIMORE - Members of the vessel boarding and security team at Coast Guard Sector Baltimore conduct tactical training exercises, Feb. 11, 2011, aboard the John W. Brown, a 441-foot liberty ship in Baltimore. The VBST routinely conducts training on ships throughout Baltimore to ensure their team is confident in their abilities in the event of a high-risk boarding. U.S. Coast Guard photo by Petty Officer 3rd Class Grace Baldwin. Members of the vessel boarding and security team at Coast Guard Sector Baltimore conduct tactical training exercises, Feb. 11, 2011, aboard the John W. Brown in Baltimore. Porter sails as part of the engine department and travels 12 to 15 times a year to Baltimore to help on the ship. The vessel is more than a museum. It is a living memorial to merchant mariners and military veterans, Porter said. The current crew, including the captain, is volunteer. The group hunts for grants, accepts donations and holds fundraisers for maintenance and upkeep, such as fuel costs to bring the ship to Norfolk. Every five years, the Brown travels to Colonna's Shipyard in Norfolk for repairs. That price tag is usually around $1 million. The ship does two to four Living History cruises a year, another way to bring in money. In September, the Brown will travel to New York for one. Before the cruise in Norfolk, the Brown will be docked at the Half Moone Cruise and Celebration Center near Nauticus and open for free tours on May 20 and May 21. "Every American ought to take that trip," Porter said. "It's a wonderful ship." "According to the assessments of Eisenhower, Churchill, Montgomery, almost everyone would tell you that we couldn't have done it without them. These ships really won the war." Tickets and more information is available at http://www.ssjohnwbrown.org/ .